Akrotiri. Located on the southern edge of the island, we find the impressive excavation site of Akrotiri. 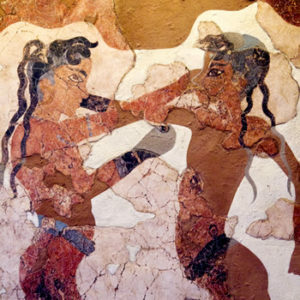 The archaeological hoe unearthed the secrets of daily life in the prehistoric civilization of Thira, a one in full bloom and so closely related to the Minoan, where time stood still when the 1600 B.C. great volcanic eruption occurred. Close to ancient Akrotiri, there is today’s settlement, a village of serene beauty crowned by its enetian castle (Kasteli – La Ponta). Panagia Episkopi in Exo Gonia. A temple dedicated to Virgin Mary, built in the 11th century by Alexios A’ Komninos, is an important meso-byzantine monument. Ancient Thira in Kamari / Mesa Vouno. Santorini’s city of historic times, a fortress built at an altitude of 385m. was founded in the 9th century B.C. by the Dorians and we can detect traces of inhabitation up to byzantine times.